To some extent, I still think that, and I’m not alone. A recent stat released by Ignite Social Media confirms that 80 percent of Pinterest’s users are female. Does that mean they’re all wedding planners? No, of course not. But it’s still fun to joke about, considering I’ll likely marry my cat. But, as I’ve further assessed the social network’s potential, I believe it goes beyond that of roses vs. gerberas, DJ vs. live band, veil vs. tiara. If this is where Pinterest currently stands – a visually oriented social network, aimed toward the stylings of Gen Y- to middle-aged women, where will it head? How can it grow? And, most importantly – how can it transition itself to be more widely accepted as a network of utility, rather than expression? 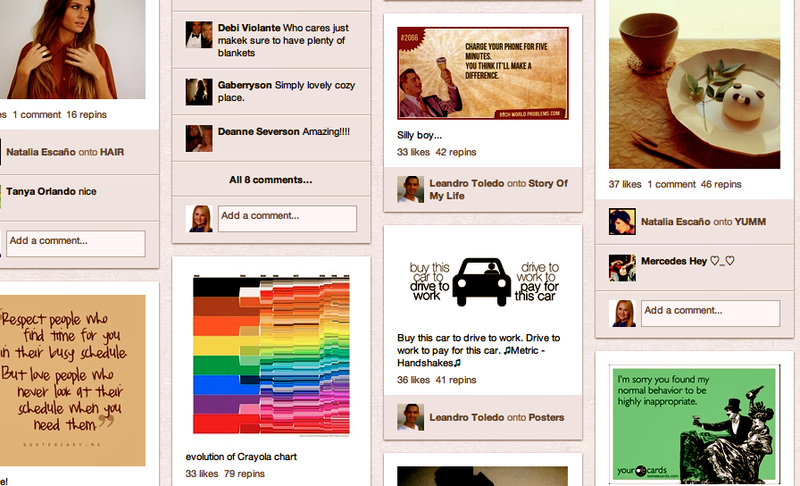 I believe Pinterest’s future lies in collaboration. Currently, users can “pin” items of interest to various-themed boards within their user profile. They can also “re-pin” someone else’s pinned content on their own board, further sharing it within the Pinterest community. But, users can not yet collaborate with each other on the same board. I think this is a huge element of missed potential for Pinterest – not only for its current user base, but in attracting a more B2B crowd that may use the site as a data collection system. This idea came to me during a conversation with an Altimeter Group colleague, Charlene Li. She explained that she uses Pinterest to keep track of infographics that she thinks could be useful to future research, or that she simply finds interesting. So, in effect, it is a new (or, supplementary) bookmarking system for her. That got me thinking — imagine how useful the site could be if multiple people could collaborate on the same board, using it as a ad-hoc bookmarking “database” of sorts, housing all images in a collaborative environment that could be accessed by specific individuals, based on privacy settings. I picture it going down like this: I get assigned to work on a project with two co-workers. It’s a large research endeavor that will go on for a couple months. We’re all working on researching different facets of the topic, but all are interrelated. Rather than each of us store the information we read, the graphics we see, within our own heads or laptops, we “pin” items of relevance to a shared board on Pinterest. This not only mitigates duplication of work, but also gives a much more effective over-arching picture (pun completely intended) of where the research is headed, what common themes are emerging and what direction may be fruitful next. Hopefully Pinterest will head this way in the future. Although it would require a more complex user interface and privacy controls, it definitely has the means to do so — especially with its built-in differentiation that it doesn’t rely on a timeline like Facebook and Tumblr do. In the end, it’d definitely be worth it … especially if the network wishes to grow its users beyond that of food spotters and brides-to-be*. *Simba and I will be registered at Petco and Barneys. Great post, Jaimy! I was thinking of something similar yesterday, but for a higher ed purpose. As you mentioned, it would be interesting to see an option where people could collaborate on one board – in the college realm, I was thinking of something like, “Ideas for our latest residence hall/academic building/etc.” While more details would need to be considered, it seems like a good way to further engage with a targeted population (students in this case), and that type of use could most likely translate across industries. Thanks for the comment, Brittany! And, I’m just as happy Simba and I could find registries that fit our needs. 😉 What a wonderful idea for higher ed you pose – I think it could be used as a brainstorming tool to get students involved, both with each other and with staff (or, RAs, etc. as you pose). I think that specific use cases like the one you present could be key to Pinterest attracting different demographics. Now, how to get a middle-aged male audience on board … that might be more difficult. Do you think Pinterest limits access intentionally? Or do you think Pinterest wants to meet these new needs, but does not have the ability? Thanks for the comment, Bryan. I think you pose a great question. Pinterest is still on limited release, so I’d assume that they’re in the phase where they’re assessing user features and needs as they arise. So on that vein, yes – I’d think they are intentionally limiting access, likely due to a need for prioritization of changes to the platform. I’d bank that it’s a smarter decision for them to get a good handle on usage demos and related data before making any big changes. Because, I’d be surprised if they didn’t have the ability, even if it does take some overhaul. I’m excited to see how Pinterest evolves now that they have a solid fan base — allowing multiple users to access the same board (or other simliar changes to network user actions) seems like it could be a small tweak with big payoff.